Just wondering what role is played by the Institute for Statecraft, funded by the UK Government. End-of-year polls are always popular as a way to gauge significant social and political trends over the past year and predict where things are heading in the next. But a recent poll of European Jews - the largest such survey in the world - is being used to paint a deeply misleading picture of British society and an apparent problem of a new, left-wing form of anti-semitism. Some 84 per cent of Jews in the UK believe there is a major problem with anti-semitism in British politics. As a result, nearly a third say they have considered emigrating - presumably most of them to Israel, where the Law of Return offers an open-door policy to all Jews in the world. 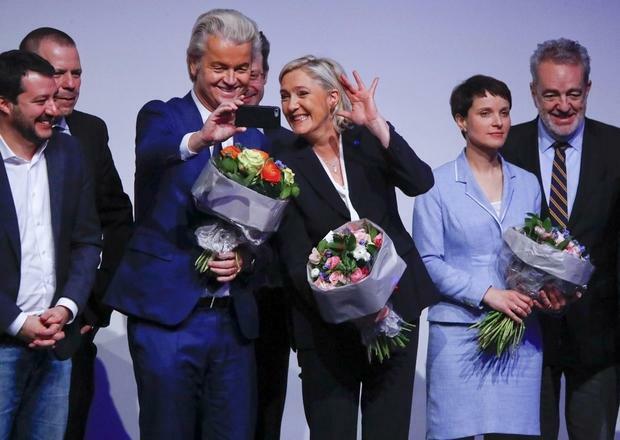 There are good grounds for Jews to feel threatened in much of Europe at the moment, with the return of ugly ethnic nationalisms that many assumed had been purged after World War Two. And Brexit - Britain's planned exit from the European Union - does indeed appear to have unleashed or renewed nativist sentiment among a section of the UK population. But such prejudices dominate on the right, not the left. Certainly Corbyn, a lifelong and very prominent anti-racism activist, has not been stoking nativist attitudes. The unexplored assumption by the Guardian and the rest of the corporate media, as well as by Jourova, is that the rise in British Jews' concerns about anti-semitism in politics refers exclusively to Corbyn rather than a very different problem: Of a resurgent white nationalism on the right. ... Buried in the Guardian report was a starkly anomalous finding - from Hungary. He placed the Hungarian-born Jewish billionaire George Soros at the centre of his anti-immigration campaign, suggesting that the philanthropist was secretly pulling the strings of the opposition party to flood the country with "foreigners". In the run-up to the election, his government erected giant posters and billboards all over the country showing a chuckling George Soros next to the words: "Don't let Soros have the last laugh." Raiding the larder of virtually every historic anti-Semitic trope, Orban declared in an election speech: "We are fighting an enemy that is different from us. Not open, but hiding; not straightforward but crafty; not honest but base; not national but international; does not believe in working but speculates with money; does not have its own homeland but feels it owns the world." All of this should be seen in the context of Orban's recent praise for Miklos Horthy, a former Hungarian leader who was an ally of Hitler's. Orban has called him an "exceptional statesman". So did Hungarian Jews express to EU pollsters heightened fears for their community's safety? Strangely, they did not. In fact, the percentage who regarded anti-semitism as a problem in Hungary was only slightly above the EU average and far below the concerns expressed by French Jews. Not only that, but the proportion of Hungarian Jews fearful of anti-semitism has actually dropped over the past six years. Some 77 per cent see anti-semitism as a problem today, compared to 89 per cent in 2012, when the poll was last conducted. The current hysteria engulfing the British Labour Party resolves itself into a pair of interrelated, if discrete, premises: Anti-Semitism in British society at large and the Labour Party in particular have reached crisis proportions. If neither of these premises can be sustained, then the hysteria is a fabrication. In fact, no evidence has been adduced to substantiate either of them; on the contrary, all the evidence points in the opposite direction. The rational conclusion is that the brouhaha is a calculated hoax--dare it be said, plot?--to oust Jeremy Corbyn and the principled leftist politics he represents from British public life. The degree of anti-Semitism infecting British society has been the subject of numerous polls over a sustained period of time. These surveys have uniformly, consistently, and unambiguously concluded that anti-Semitism (1) has long been a marginal phenomenon in British society, infecting under 10 percent of the population, (2) is far less salient than hostility to other British minorities, and (3) is less pronounced in the UK than almost anywhere else in Europe. One might suppose that settled matters. But in 2017 the British Institute for Jewish Policy Research (JPR) published a study that purportedly refined conventional wisdom by measuring the "elasticity" of anti-Semitism: that is, not just the percentage of confirmed anti-Semites, but also the prevalence of stereotypes that stigmatize Jews. It found that, whereas a mere 2-5 percent of the British population can be reckoned anti-Semites, fully 30 percent harbor at least one anti-Semitic stereotype. Is Burg guilty of anti-Semitism? When you've blogged as long as I have (since 2003), you think you've seen everything. Until tonight, I never in my wildest dreams imagined that Israel as a state could become anti-Semitic. Of course, this notion violates just about every sacred principle of Zionism, which purports to be a haven for Jews around the world from persecution and anti-Semitism. No longer. With today's "piling on" by the Israeli foreign ministry onto Hungary's right-wing government's anti-Semitic campaign against George Soros, Israel has sunk to the dregs. Of course, many of us knew that David Ben Gurion and major elements of the Zionist movement as a whole had no compunction about collaborating with Jew-haters like Hitler if it benefited the Yishuv. The fate of state become more important than the fate of individual Jews. This seems to be the same logic Netanyahu has adopted vis-à-vis Hungary. "The fact that history did not bury us after World War I was thanks to a number of extraordinary statesmen like the regent, Miklós Hórthy. This fact cannot be contradicted by mentioning the unfortunate role of Hungary during World War II." Keep in mind, the Hungarian regent was someone who joined Nazi Germany in declaring war on the United States the day after the Pearl Harbor attack. He only escaped the hangman's noose after the War by switching sides and helping the Allies fight Communists. ○ Miklós Hórthy: Hitler's Vassal? On 19 March 1944, following a botched attempt by Governor Hórthy to withdraw from the Axis side, the German army occupied Hungary. The Hungarian Jewish population, which by that time became the largest Jewish population in Hungary, until then was subject to discriminatory racial laws based on the German legislation but not physically threatened. After the occupation, however, the small German contingent led by Adolf Eichmann that enjoyed the enthusiastic support of the Sztójay-government and thus the cooperation of the Hungarian public administration, in a matter of few months deported more than 400.000 people to extermination camps. The last chapter of the Holocaust was predominantly written by the blood of Hungarian Jews. Perhaps also Bibi Netanyahu losing grip on the Jewish community in the U.S. of A. A lot has been written about the Jewish diaspora and Netanyahu had made the choice to cozy up to the fundamental evangelists and the alt-right movement. Israel became part of the international opposition to get a Republican elected in 2016 as revenge for Obama and Democrats. JCPOA - the nuclear deal with Iran.